Photos by Danielle Chastaine: The RISE Together coalition held a tour of the Liberty Bank building on Monday, Nov. 5. The six-story affordable housing redevelopment is expected to open in early 2019. Key Bank provided RISE Together a two-year $300,000 grant during the Nov. 5 event. Under the shadow of looming gentrification, rapid landscape changes and a lack of affordable housing, some communities have chosen to lift themselves up instead of waiting for others to aid them. 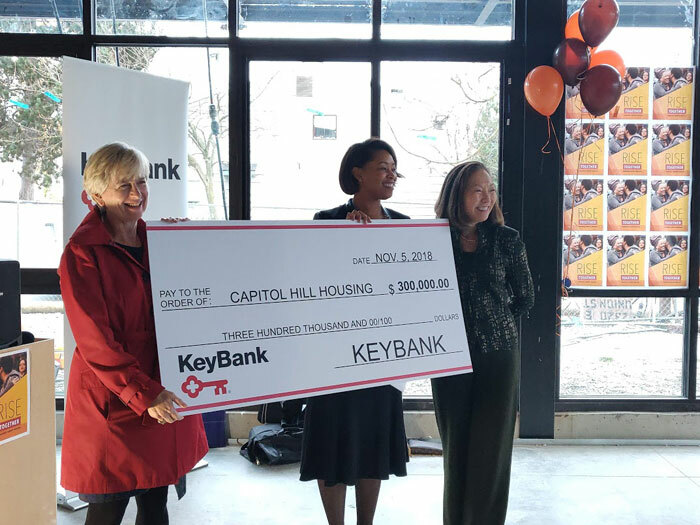 This is the case for a coalition of grassroots and nonprofit organizations, Capitol Hill Housing, Africatown Community Land Trust, Byrd Barr Place and Black Community Impact Alliance, which received a two-year $300,000 grant from Key Bank on Monday, Nov. 5. The grant will support the ongoing work the organizations, known collectively as RISE Together, are performing to expand affordable housing and local business in the Central District. Key Bank officials gave a large check on Nov. 5 to RISE Together at the Liberty Bank building, named for the first black-owned bank in the west that once stood there at 24th Avenue and East Union. Liberty Bank first opened in 1968, and 50 years later it is the site for a mixed-use redevelopment that will provide more than 100 affordable apartment units and ground-floor retail space for multiple local minority-owned businesses. 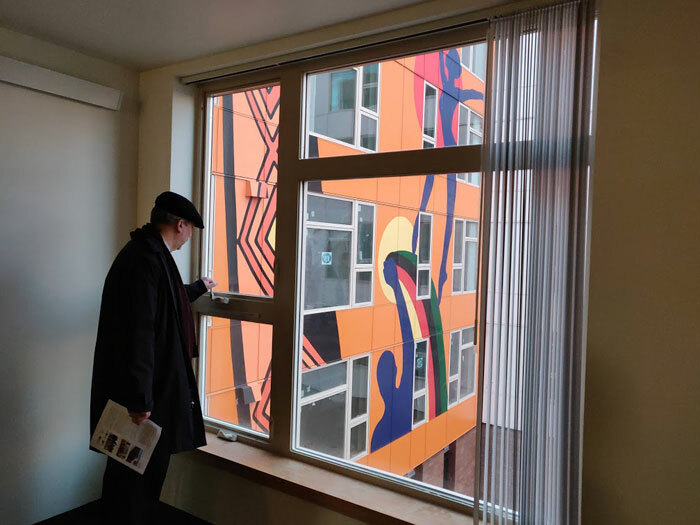 “Now in redeveloping it, Capitol Hill Housing in partnership with community partners is working to honor the heritage of the building while also building continuity with the past,” Wong said. CHH senior vice president Jill Fleming said the two-year grant from Key Bank will be used for more than just the Liberty Bank project. RISE Together is working in three Seattle neighborhoods on a campaign to build affordable homes and business capacities. Another project includes Africantown Plaza. There is also some work being done to preserve LGBTQ art in Capitol Hill, and CHH is working on housing in White Center, outside of Seattle. A small group was granted the privilege to tour the work being done on the Liberty Bank building. Outside the building, a bright mural is painted on the six-story façade to welcome residents and visitors at the entrance. Upstairs 115 studio, one-bedroom and two-bedroom apartments are under construction. Each apartment has large windows with views of the neighborhood, dishwashers, new kitchen appliances, large bathrooms, vinyl floors and thermostat-controlled heating. Each floor has a shared laundry facility. Roof access grants gardening opportunities and beautiful views of the city. RISE Together has received funding from Bellwether Enterprise, Heritage Bank, Washington State Housing Trust Fund, Seattle’s Office of Housing and Capitol Hill Housing Equity, coupled with fundraising efforts over the past couple of years. Wong said the complex has no set opening date, but they are aiming for early 2019. RISE Together has already received applications for apartments. Fleming said there are a few requirements to rent an apartment in the building. Mainly families and individuals who apply can only earn 30 to 60 percent of the area’s median income. The income percent requirement is based on each family’s size. 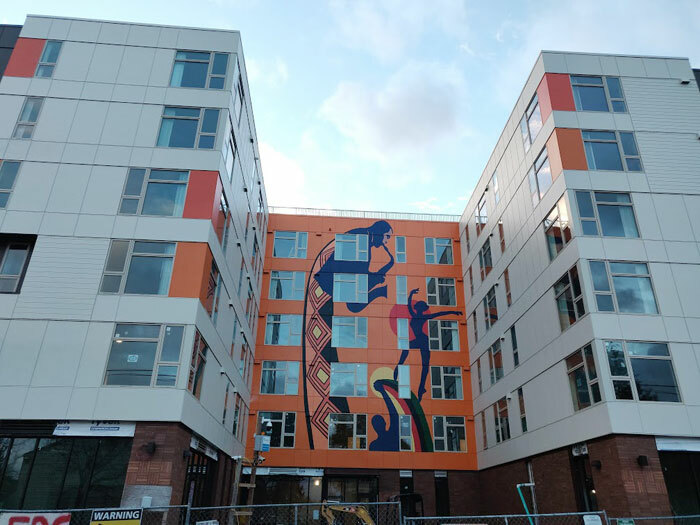 One of the most unique parts about the project is Capitol Hill Housing’s effort to keep the building’s history of minority ownership. In partnership with Africatown and Byrd Barr Place, Byrd Barr Place will have both a right of first offer and first right of refusal to acquire Liberty Bank after 15 years. Fleming said this project is a way to help a community feeling priced out and displaced. Key Bank market president Carol K. Nelson joined RISE Together on Nov. 5 to present the grant check. Nelson grew up and attended school in the Central District and has seen the rapid changes in her home. Nelson said she wants to see the funding help families keep housing in their preferred neighborhoods. “It really is part of who we are,” Nelson said. Liberty Bank opened in May 1968 at 24th Avenue and Union Street in Seattle, according to RISE Together’s website. Liberty Bank was the first black-owned bank west of the Mississippi River, as a response to the lack of investment and redlining in the neighborhood. The bank closed in 1988. The building became Emerald Bank and then was purchased by Key Bank. When Key Bank first discussed closing the building, local executives came up with the idea to work with Capitol Hill Housing and offer the property at below market value so it could become affordable housing. Capitol Hill Housing worked with the daughters of Liberty Bank’s original founders, a former executive of the bank, long-time community members and leaders in the Central Area to come up with the Liberty Bank project, according to the website.